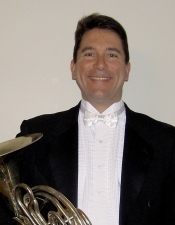 Ron Beitel is currently the Associate Principal Hornist of The Utah Symphony. Prior to moving to Utah, he performed as Associate Principal Horn of the San Antonio Symphony and Principal Horn of the Memphis Symphony. His solo and chamber music appearances include performances with The San Antonio Symphony, The Cactus Pear Music Festival (San Antonio), The Olmos Ensemble (San Antonio), NOVA, and Intermezzo. Mr. Beitel is a graduate of the Cleveland Institute of Music.